I've always been curious to try Invisibobbles but when they were first released I believe they only came in bright, very obvious colours. At the time I had pretty much black hair and didn't want to use something like a bright bright pink bobble as it would be too obvious against my hair. I was pleased to see that they later released some darker, much more subtle colours, but I never got round to actually picking some up. So I really pleased to see a pack of Invisibobbles in my amazing September Glossybox. Invisibobbles are strange looking little things! I'm not sure if people still have home phones anymore (we still do) but if you do and it's not cordless then there will be a coiled cable attaching the earpiece to the phone. This is what Invisibobbles look like; a ring of telephone cable. 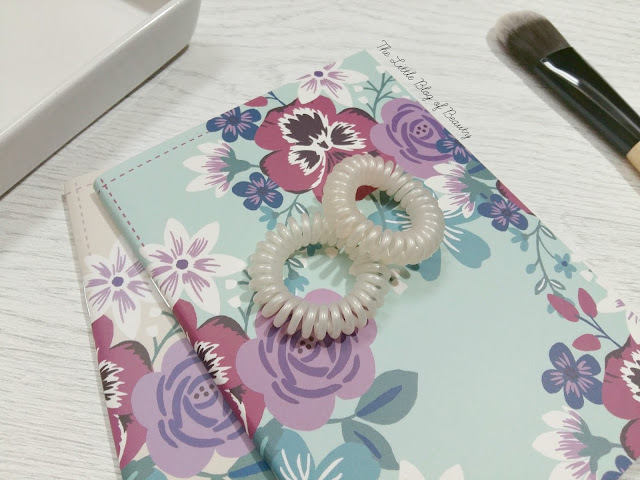 The idea behind them is that the coiled ring places uneven pressure on the hair, which stops the bobble making a kink in the hair that will be visible when the hair is down. They also shouldn't cause tension headaches because although the hair is held securely it's not held tight. I originally thought that Invisbobble referred to it being invisible in the hair and thought that was impossible when they come in such bright colours. But it obviously refers to the lack of tell-tale kink rather than that you can't see them in your hair. To be honest I've never really been that bothered by this kink, what attracts me more to this kind of bobble is that it's supposed to be kinder to your hair. I didn't think these would do a good job of keeping my hair up but to begin with actually they do. The issue I have is that as I use them they start to stretch. They do spring back to shape when I take them out again but they become stretchier. When new I wrap one round twice and it holds my hair securely but as I use them I then have to start wrapping them round three times and they don't hold quite as securely any more. When I do take my hair down it is indeed kink free. Although these are snag free I do have to be careful when I remove them that they don't tangle slightly where I've looped it to wrap it round my hair for a 2nd/3rd time. I've also found that mine are slightly picking up my hair colour, but that would be because the bobbles are a pearlescent white and my hair colour is red, so this is inevitable. I do really like these bobbles but I feel the stretching means that I would get through quite a few as eventually they would become too big to be as effective as they were when new. They appear to range between around £3.75 to £4, so they're not that expensive but are a little more expensive than I'd like to pay if I'd need to replace them regularly. I personally think the ones that are a tied piece of elasticated fabric work better for me. Invisibobbles are now available in Boots and you can pick them up on the Feelunique and Glossybox websites. I've never tried these but I had heard of the stretching issue, I have really long hair so I'm always a bit skeptical that things like this would keep it up. I got these in my Glossybox too and I really can't get on with them. These are quite the rage in Dubai at the moment. But i agree with you. I like the fabric ones better too! I haven't but I've heard a lot about them! Ace post. I can't believe I still haven't tried these, I need to get my hands on some, and I really want some hair ties to, rather than my boring old black bobbles!